Synopsis: There’s nothing like a wedding! The joy, the fun, the memories—the stress. As a wedding planner, Anne Richardson has seen mothers of the bride turn into Momzillas, and she’s determined not to do that when it’s her daughter’s turn to get married. But once Laney gets engaged, all bets are off. Anne becomes obsessed with giving Laney the perfect wedding she herself never had. And that wedding needs to be held in Icicle Falls at Primrose Haus, the perfect setting. 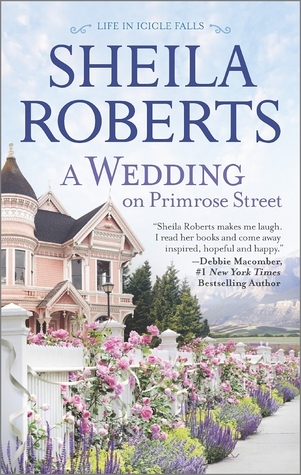 My take: Our daughter was married a few months ago so I knew I wanted to read the newest book in the Icicle Falls series: A Wedding on Primrose Street by Sheila Roberts. I thought Roberts nailed the dynamics that can arise between mothers and daughters, event planners and mothers-of-the-bride, and husbands and wives when planning a wedding. In her typical style Roberts had me alternately laughing and cringing as the events drew near. What I liked most was how, when they stopped to take a breath, the characters tried their hardest to remember what was most important about the happy day and the people involved. There are several bridal shower and wedding recipes included at the end as well as a fun epilogue of sorts. I enjoyed it and look forward to the next Icicle Falls book.